(at work): Patient is 80+ with really nice Dell laptop in bed with her, she is ferociously busy on it. Patient: Oh, no! It's not that you guys are boring! Its just that....if I hadn't brought my laptop, my farmville crops would have withered while I was here! *horrified look*. To those of you that enjoy me posting like 2-3 times a day or at *least* every day, I am so very sorry I have not been meeting your expectations. My car broke down Wednesday and it has been a very unecessary roller coaster ever since. I will draw you a picture of how that all went down, in a future post. Also, I have a huge exam Monday and due to the fact I have an extreme case of senioritis, I have neglected proper preparation for this exam until....now. So I must devote all attention to this until Monday! So, on monday or tuesday, look forward to some major blog action. You better be ready, you will be swept off your feet in glory and almighty happiness. So...yeah. - Aides rule the hospital. Okay, Now that I finally have time to sit down and write this, lets do this! Let me warn you now- this WILL be a long post. My thoughts about the army before the presentation? "Army guys are hot"...."Or...I could never do that" or "Anyone that joins the army right now is insane...we are in the middle of a war." My thoughts after the presentation? What happened next was the most ballsy thing I had ever done in my life ever. (Not to mention- this time last year I was in my "JUST DO IT" Phase, when I joined all the clubs I was afraid to join and did everything without fear because I was just in an adrenaline phase). This is when my automatic pilot actually turned on. Adrenaline kicked in and I pushed out my chair from the table, ignored the questions from friends as to where I was going. I left the room, went into the hallway and introduced myself. I did it. He was interested in me, of course, thats what they came here to do. We set up an appointment to have a "real" meeting and swapped emails. I sat back in my seat and asked myself...What the hell did I just do? It was a rocky week after that. We met, twice. We talked about the army and everything it had to offer. We talked about the drawbacks. The commitment. The benefits. The classes I would have to catch up on. Basic training. Other girls in the army. Iraq. Signing. - I didn't believe in myself. I didn't think I would make it. - I didn't think I was "fit" enough to make it through boot camp. - I was afraid of the commitment. - Me joining would have caused me to lose and hurt a lot of people in my life. - I couldn't tell my parents. For a more intricate narrative of what I was going through at this time, read this. It might make more sense: TeamWork Its really long, but the army frustration comes in about 3/4 through. I wasn't in a good place, my thoughts were everywhere, all the time. I was in an adrenaline-save-me phase and just wanted something (army) that could bring me somewhere. I was in the midst of having just finished one of the hardest semesters I had ever gone through, and at the bottom of the hill for two harder semesters yet to come. I didn't have any faith that I could even pass those classes. Somehow, I did, and now I am writing about my future because graduation is in 2 months. Crazy. Well, my fascination of the army never retreated after that. In fact, it grew to extend a fascination of the Air Force, maybe even more so than the army, but probably pretty equal. I have been on top of the army, reading about their progress and whats been going on in the newspapers as much as possible over the past year. Someone says army and I instantly look. I read three books written by army nurses, 1 from Vietnam and 2 from Iraq. I loved it. I knew that I could do what they had written. It made it more realistic- It drew a better picture of what I was missing, what I would be getting if I signed up. At this past nursing convention, another army recruiter was there. This time I wasn't nervous to go talk, it felt natural. I wanted to. I picked up some brochures, talked a little. I GOT LOTS OF COOL STUFFF!!!!!! Recruiters are good at that. Then I went to my last seminar for the day, one I was really excited about, which was "Disaster Preparedness" which was taught by two female air force nurses. They were best friends. They had pictures of them in Iraq. They came back, they are still alive. I was fascinated. Me and a friend stayed behind after the lecture, and talked about the consequences of joining if we each had "food intolerances"- I can't have any dairy and she couldnt have any wheat. It would be hard, but she said we could still do it. So this brings me to why I wanted to write Part 2. For me, and for anyone that cares what happens to me after Graduation. As of *right now* these are the (specific) pathways I am considering. 1) There are two nurse residency programs in Denver, Colorado. I group them together because they are associated with the same hospital but one is with the Children's portion of the hospital and the other is general nursing. I want to go to CO because it is something new. I fell in love with the state in my senior year while on vacation. I said to myself, "I want to live here", and I never forgot. Why I don't want to go: I'd have no support. My family doesn't support it and I need my family in my life. Also, I would miss the ocean terribly. Moving to CO is as big and scary to me as potentially joining the army. 2) I could stay in New Jersey and work for the same hospital I have been with for the past five years. Why I should do this: I know everyone, I have everyone's support, I love the staff there, I know how things work, I know where everything is, my family wants me to stay local for the rest of my life.... reasons I shouldn't: If I stay now, I will never leave. I know myself enough to know I will never grow the balls to leave my job and move to CO "Just because I want to", especially if, by then, if I have kids or a boyfriend/husband. As the years go on, it will be harder and harder to make the move. Also, as much as I love the area I grew up in, I just want somewhere new. Sometimes it takes moving away from home to realize how much you want to BE home. I know, I realize completely what I would be giving up: Where I live, I am an hour from NYC. I am five minutes away from back dirt roads that wind away to the heart of New Jersey. I am 2-4 hours away from the Atlantic ocean. It is a day trip. I have every restaurant or store I could possibly ever think of in a 30 mile radius. But...I just want to see what else is out there. Is that so wrong? If I hate it, I can come back home....can't I? •Perform traditional clinical services, including inpatient and outpatient care ranging from newborn care to geriatric services, from obstetrics to orthopedics to mental health, from prevention services to chronic care or acute disease management. •Manage the review and approval of drugs and medical products. •Respond to public health emergencies. •Develop and implement national health policies. •Develop and implement clinical practice guidelines and evidence-based reports on health care. •Coordinate prevention and education efforts on a variety of public health issues. •Develop nursing training and education programs for basic and advanced practice nurses. •Low-cost health care for your family. •Veterans Affairs benefits, such as survivor and disability benefits, home loans, and burial allowances. And, you can work anywhere in the United States...and jump around if you get tired easily, Like I do. 4) I join the army or air force right off the bat. 8 year commitment. lots of the same benefits as listed above. I could be sent to Iraq, yes. But..if I do the corps, I could switch over to army/airforce later in life and keep my rank. So, its a lot to think about. Well, those are my *main* options. I have been waiting for something perfect to just come along and say BAM! THIS IS WHAT YOU SHOULD DO!!!! And I think just maybe, maybe that is the corps screaming that. It makes a lot of sense. But is still scary. Here is a picture I made, without intentions of posting. I started with the "What now?" And kept going, until there were no empty spaces left. It says everything on my mind. PSS my spell check is not picking things up like "Pdfjkhsdkfh" so I don't think its working....so sorry if there is a lot of ridiculous spelling errors. Despite wanting to be a writer, (dont even get me started on where that fits in to my plans), I can't spell. Sorry. Well, let me tell you now that this is not Part 2. I am not ready to spit out Part 2 yet....for many reasons. Lots of big bombshells in part 2. ooooh, *suspense* ! No but anyway, today I am going to entertain you with pictures of the week! Yes, you get picture(s)! And these are not on my campus, of babysitting or at home. They are from Atlantic City! Thumbs up for variety! Woot! Anyway, lets show you some prettiness first and then we shall discuss the prettiness. Person reading on the beach....perfect. I am jealous. So this past Thursday and Friday I attended the State Student Nurses Convention for New Jersey, and it was pretty interesting. I learned a lot of things and not just for nursing. 1) I love the beach. I love the beach, I love it. I am in love, with the beach. This is something HUGE to consider if I choose to move to Colorado. I will be really far from either ocean. That is a major disadvantage. This part of me means a lot, and I will bring back up my love for the beach. 2) I got some practice with how I'm going to conquer Europe with my food allergies and health issues and having a hotel roommate(s), not being in my own "home"...I spent the two days with my only alone time as time in the bathroom. That is hard for me. I cherish alone time. I love being with people, too, but I am one of those people that needs some alone time too. With a two day trip, I was prepared. I brought poptarts, which are dairy free, to eat as emergency snacks in case something was not provided. Otherwise I did OK. I ate the poptarts for Day 1 breakfast, lunch was provided for us Day 2- (Ham sandwich, chips, apple, cookie.) I was nervous about this because of the ham and its probable infestation with sodium nitrate, but I surprisingly did not get a headache. I ate the sandwich & chips. For snack later, because I could feel my energy depleting rapidly as well as my blood sugar, I ate the cookie...despite knowing that 1) It had milk, and 2) it had chocolate, which also has milk in addition to giving me a headache anyway. So, as you can predict, that made me feel sick. Dinner was a buffet and I found some chicken and broccoli, turkey and plain noodles. Still felt sick after, probably the minor amount of gravy on turkey. Day 2- breakfast provided- but only gave muffins, fruit & pastries. I was late, only made it in time for cantaloupe (sensitivity) and muffins and pastries...both with milk. so, yeah. 3) I learned a lot about nursing I didn't know before. I went to a disaster preparedness seminar....taught by two air force nurses. It was amazing. Did you know you can get your masters in Disaster preparedness? Do you know how extremely interested in this I am? Extremely. Thats how much. I am considering this, very much so. But I didn't. I put my responsibility coat on and went to a seminar about what recruiters are looking for. It was the adult thing to do. I chose responsibility over playing around on the beach......am i growing up? Or am i just a wimp and didn't want to "break the rules"? Either way....hm. And it really is making me smarter. Each weekend it teaches you about something new. And it is written by the NYT writers...This weekend I got a review of the two world wars. It was a nice review and now I feel I can answer a couple questions and hold my own with a smart person...about the world wars. Then I would politely leave the conversation when it got more complex than that. So, overall, the convention was a big learning experience and I am glad I went. Tomorrow I will *try* to write my "Part 2" from yesterday. I already wrote some of it. But it requires a lot of thinking so we shall see. Right now, It is February. I graduate in May. Early, May. I take the NCLEX in June, most likely. It is really, really, really time to start thinking about real and actual and concrete options for the next step in my life. I firmly choose not to say "the rest of my life" because I honestly don't have the commitment for that, unless I end up really, really, really liking my job... which, would be great. There are SO MANY CHOICES. I want to do a lot of different jobs. (In Nursing). But the nursing community *tends* to prefer you to choose a "line" of nursing work, rather than try a bunch of different things. OF course, some nurses disregard that advice and dart from working in a NICU to working in a doctors office...But most nurses follow a chain, or line. For example: Start out as EMT Nurse, go to ER nurse, go to ER chief nurse, go to flight/transport nurse, go to...something crazy. Emergency has a TON of crazy options. I honestly feel like I am in high school again, and I am changing my mind every single week on what type of nursing I want to do. There are four "paths" I can see myself following. 1) Labor and Delivery: I say this because I came into this Nursing program with L&D deadset in my goals- I desperately wanted to be an L&D nurse and nothing else. Well, that has changed over the last three years, but recently I have been reconsidering that as a strong possibility. Will I be a midwife, as originally planned? Probably not. Is learning how to deliver a baby an amazing skill to possess, in any situation, for the rest of your life, in and out of the hospital? Yes. Will I like working on an L&D floor? Probably. 2) Floor Nurse. Regardless of this is on Med/Surg, or Oncology, or telemetry, or wherever...I think I would like being a floor nurse. Even if it is "at the bottom of the nurse chain" as far as nurse positions go, I would feel OK there. Once I got in my comfortable "been on the job for awhile" shoes. This reflects two parts of me. The part that wants to just be alone and come to my job, do really good work, and go home. It also reflects the part that desperately wants to make a set of nurse-friends on a floor that I can trust and rely on and laugh with, a lot. I want that. I want both parts. There are two nurses on my current floor that always work together and they always are making each other (and everyone else) laugh, and always have each others backs. I want that. But at the same time I feel that being on the floor promotes independence, if you so desire. I see a lot of nurses on my floor that are plenty sociable with the other nurses, (as I would be), but they stick to themselves and get their own work done. I can see myself being either. I know, that as a floor nurse, I would be the best that I possibly knew how to ever do. I have a lot of Med/Surg experience. All I need perfection on is the actual "Nursing skills" (i.e. IV's, wounds, foleys, talking to doctors, reading doctors writing, calling doctors, giving meds, etc.). I have the "compassion" down and the Therapeutic communication down. the Caring. I'm working on my critical thinking and physical assessment skills. They will come. As a floor nurse, I would put every thing I have learned over the past 5 1/2 years as an aide and past 3 years as a student nurse and put it into giving every single one of my patients all of my attention and doing everything I can for them. That, I can't wait for. I always try to do that now, on my job, but it is very hard to do when you have 30 patients. I look forward to managing 6-10 patients (even though that is still a lot of work). 1) I like to work fast. I like having a TON of things on my mind to do. I like feeling scatterbrained. Not all the time, of course, but I like being busy. It makes me feel important, and needed. Like I am doing really important work. I like the thought of climbing up on a stretcher on my 14th hour of work and doing CPR. I like being so busy that I forget to even eat. Thanks to my ADD, I like having something to do every five seconds. 2) Patients are on a high turnover. This is a disadvantage and advantage- dis because if you like them, you can't connect with them, you can't get to know them. The most you can do is leave a lasting impression on them to help represent your hospital and move on to the next patient. Advantage because if you don't like the patient...well, they are in someone else's hands pretty soon. I would be seeing a lot more than 6-10 a day. But for shorter periods of time. ER nurses need excellent critical thinking skills, and need to be fast. Excellent instincts....Can I do that, though? Okay. This is funny. A couple of months ago I was in an extreme holistic phase. I wanted to treat myself holistically and the rest of the world. I was obsessed. Have a headache? Take this herb. I wanted to focus on nutrition. This all sounds lovely, but pretty much means I would have to be a nurse practitioner. There are a *couple* other options with holistic nursing...but, I'm just not sure. I don't think I want to land in an NP position. But then again I once said I never wanted to do ER nursing. I still like nutritional healing. But I have lost a *lot * of faith in the whole shebang because all of my personal treatments for my own health failed, and I am back to square one- despite making a lot of dietary changes. And I can't afford to make an appt to actually see the HNP to discuss what else I could do...and then she would prescribe a lot of things, and thats a lot more $$, and I just don't know. Its complicated. So, Holistic nursing is still a possibility. But I'm thinking....less of a possibility than it once was. Okay. This is a long post. But I got a lot of important thinking done. Tomorrow, or Sunday, look for Part 2: Actual Options, not Pathways. I.e.-Getting Specific. I also will talk about the student nursing convention I just got back from (I learned a LOT!!!) and update you on my new york times mission. But its late and this is long enough for tonight. Thank you for reading..
patient calls call bell. My coworker answers bell. Patient is normally very nice, alert and oriented to person place and time. Me: What did he want? CW: *puzzled look* I don't know...Something about his input and output, and garbage and input again... I don't know. Patient calls again. I answer this time. Me: Hi, Mr. Patient, How can I help you? Patient (on verge of tears): Everybody thinks my input is my output and my input is garbage and everyone is throwing my output away. Me: Well, Mr. Patient, what do you mean by input and output? Patient: I mean my input and my output and everyone thinks it is garbage but its not! Me: I know its not garbage. No one thinks it is garbage. Me: Are you concerned about your foley catheter? Patient: *looks at catheter*...No, you emptied that. Patient: Everyone thinks my input is garbage on my table and is throwing it away. And my output. Me: *Looks at table* Mr. Patient, I can assure you- No one is going to throw any thing away without your permission. No one thinks any thing of yours is garbage. Patient: OKay. I Feel better now. Me: Okay, well- Goodnight. Try and get some rest. Patient: THank you for listening to me. Isn't funny how you find a profession that is right for you, even if it may be extremely undesirable to others? For example, many many many people think nursing could never be for them. My own family has no idea how I do the jobs I do at work because they think it is extremely gross....but it just sort of fits for me I guess. At this point I can't see myself doing anything else (other than my dream job, of course- Pixar!). So everybody has that job in their mind that "they don't know how people survive in" or they think "they could never do". Mine is teaching. I thought about it, going back to get my Masters and teaching nursing to college nursing programs one day....And its still a *slight* possibility, but getting smaller and smaller. This past week It was my turn to go to the Junior clinical (same place I was last year-ah!) and help them with their assignments. Our job was to pick out their patient, learn about their patient, go home and prepare questions to ask them the next morning, go the next morning to clinical, ask them all about their patients and watch them squirm because they are nervous and haven't learned anything yet, and then you feel awesome because you know things and they don't. Well, I did fine with that part. But during the day the students come up to me asking me questions and I am thinking in my head, "What kind of a question is THAT? Where do you come up with these things???" And I think it is because of this: Nursing students are very inquisitive. As am I. They like to understand everything, to every possible extent. When learning about a disease their patient has, they want to know as much as possible, even if that means coming up with the smallest, most detailed questions about the disease. I remember doing it to my seniors when I was a junior and I remember asking my professor. Not because I wanted to put them on the spot, but because I genuinely thought they might know...They seemed so smart. They handled our questions so smoothly, when I, this week, probably looked at them very strangely and gave them the best answer I could. I could never be a teacher. This was my second experience working with someone that I was assigned to teach. It was weird because this time around, it was their patient- technically, not mine. I was only their to watch the student do the assigned work. But the way I work- I just want to get things done. I don't like to just stand there watching something (that also ties into my extreme ADD), so when the student is doing one thing, I desperately want to continue on to the next activity and complete that, even though I know she is supposed to practice. Oy. I guess I'm used to doing that at work, me and my fellow aides can practically read each others minds and can work as one being- with 4 hands getting the job done. And then the students ask questions because they like rationale. Why are we taking her blood pressure again? Why does the pulse ox light turn on? Why is the sky blue? Why do we have to keep my patients feet up? Why does the shot she gets come prefilled? my NYT reading is not going great. I need more time! AH! But, i did buy an awesome book on clearance that is called "Smarter by Sunday" and every weekend you read about something new that they teach you about, and supposedly by the end of the year you will be a genius. So yesterday I learned about Illiad and the Odyssey and Homer, which I already knew about but it was a nice review. Also, I am reading a lot of Atul Gawande's work, and he is SO fascinating to read. I can't get enough of all these smart people. 4 year old boy, (R): What are you making? (R): I don't like green beans. (R): I can already feel myself growing taller!!! I'm pretty sure thats all I have to update you on. I probably had a lot more in mind when I said last post "Oh my god I have a lot to update you on" but now I cant remember. So, sorry for that false excitement. Ok so, my reading of the NYT daily....well, that's not exactly possible. Unless you have countless hours in your day and take no naps, and have unlimited amounts of time to just sit there and learn things, then maybe, just maybe do you have time to actually finish reading the New York Times. Usually, on a good day I will read 85% of international news and 95% of National news. But reading it every day has grown to become a very unlikely goal. But I am trying, very hard. I have also picked up the enjoyable habit of reading "The New Yorker" which I find to be very easy to read but also very interesting. My professor that I have that I mentioned previously that inspired me to read the NYT- well she was lecturing about environmental health and mentioned a key piece of information and quoted WORDFORWORD articles of information that she could only have learned from a particular article in the NYT that i specifically remember reading a couple of days ago. 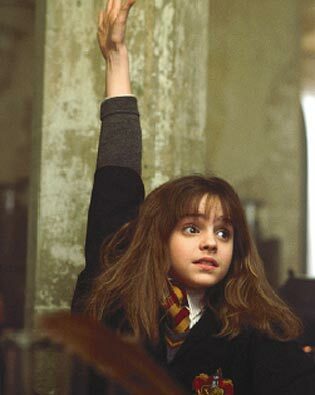 I had the *OVERWHELMING* urge to act like Hermione and raise my hand and be like, "I KNOW WHAT YOU ARE TALKING ABOUT!! YAY!!!" or, "I READ THAT ARTICLE TOO!! LETS TALK ABOUT IT AFTER CLASS!!!'. But I didn't. Because really, where would that get me? As much as I want my teacher to know she inspired me to be smart, I can't just raise my hand and tell her that I'm smart now. It doesn't work like that. And plus, no one likes Hermione when she acts like that. Anyway, lets get to the real purpose of this blog. Oh my god, on a side note, I have so much so say that has happened since Tuesday. Maybe I'll make a separate blog all about that. Do you want to read about that or do you not really care? I think you care. Don't lie. Anyway, lets really get to the purpose. Upon stumbling upon (bad wording-sorry) the National news in NYT on February 7, a certain article instantly caught my attention and I love when that happens! It was titled "Restaurant Nutrition Draws Focus of First Lady- Expanding the Push for Healthier Eating." Can we all take a moment of silence to jump up and down and say YAYY!?? Ok! Good! This is FABULOUS! I was not aware that Michelle Obama was involved in all these nutrition campaigns. If I were ever a First Lady, this would definitely be the kinds of great things I would do. This is how we are going to reach the people. She has so much power, she is the person to do it. I am so glad she is making the move to do so. "A team of advisers to Mrs. Obama has been holding private talks over the past year with the National Restaurant Association, a trade group, in a bid to get restaurants to adopt her goals of smaller portions and childrens meals that include healthy offerings like carrots, apple slices and milk instead of French Fries and Soda." Obama, (M), Also has magnificent plans to lower prices at Walmart for fruits and veggies and to reduce the amount of fat, sugar and salt in all Walmart products. This is also fantastic. Sad as it is, but through Walmart is how to reach a large percentage Americans in this economy. If I had to make up a percentage I would say 60%. That is a lot. Walmart is cheaper and even the middle class is sensibly choosing Walmart over higher retailers, especially with the multitude of Super walmarts and their ability to carry groceries. Have you ever noticed that the chips and unhealthy foods are always cheaper than the fruits? A bag of cheetos is cheaper than a carton of strawberries. You can see how its easier for families to choose the cheetos. If Mrs. Obama can effectively lower prices on the right items, we can help families choose healthier foods...even if just the the cheaper cost. ...Where to even start? First of all, I love to eat out, as do many, many other people. It is a good social thing, when your town has nothing to do (like mine) other than eat out all the time or go to the movies. It tastes Yummy. Its nice to see other people that live in your town. Its nice to eat food that you didn't have to make or clean up. It's nice to be waited on. But is it nice to feel guilty and fatter the next day? What if you knew exactly how many calories you consumed during that meal, or grams of fat? I can definitely say that going out to eat a lot has put on the pounds. If we as a country, if Mrs Obama, can figure out how to make restaurants healthy, it has to happen all at once. All restaurants have to do it together or they will all fail. If one chain restaurant "goes healthy" the people will notice a change in food, perhaps, and will shun that restaurant (A) and go to another one (B). A will take the financial cut pretty hard and B will love all the extra customers, and see no good reason to "go healthy". Soon enough, restaurant A will have to return to its "good" food if it wants to survive. But if restaurants did this change together, if it was mandated by law (which is impossible because this country cant agree on anything in congress), then all restaurants would be equal in the healthy eating boat. If all restaurants fail, or restaurants overall notice a decrease in business, then we still succeeded. People will have to eat at home and therefore, most likely a little healthier. At least, if anything, they will know what is in their food. Now by restaurant, I mean chain big restaurants, that you sit in and they bring you food after ordering. Don't even get me started on Fast food. I don't even know what to do about fast foods....But I do know that if we regulate laws on standards of cooking foods in restaurants, we surely have to either wipe out the fast food kings or get them to adapt these new laws as well. If I ran the country and was involved in this campaign, I would fight to make soda illegal in restaurants. Okay, everybody gasp. No soda??? What??? I LIVE off soda!!!! I know, I know. Hence why this is unrealistic. Just because I believe soda is a BIG factor in this country's obesity and I haven't had a soda in over 5-6 years, doesn't mean everyone else is going to agree with me. But think about it. In restaurants, you drink socially...you get refills, you may even drink 2-3 glasses of soda. And diet soda? Worthless. Its still atrocious. If we could get rid of soda in restaurants, think of how much it would help kids, help combat diabetes, and obesity. With the rate of how much people eat out, we could target a big population with this change. And its not like you would be stuck drinking water...you could still have ice tea combinations available (still high in sugar, but better), hot tea's, juice's (for kids)...and, the almighty...water. And Water is free, too. Big incentive. OH! That just dawned on me. What if Ice tea were made free? And soda made more expensive? Is that more of a hassle than making soda illegal in restaurants? THink about it..
On a side note- My dining hall at school has been trying recently to put nutrition labels on foods throughout the hall. Well, in my mind, I am even more turned off...For looking at the label for a muffin which I would have guess to be healthy since it was the "Balanced Way- Healthy" muffin of the day, it still had 8 g of Saturated Fat in it...so, needless to say, no more muffins. I think i would have been better off not knowing. How can they call it healthy when it still has that much crap in it? So thats the end of my ranting....I promise. Sorry for the unnecessary amounts of food ranting. I hope you found it interesting and maybe helpful. I am no stranger to allergies. I experienced my first anaphylactic reaction to peanuts when I was only one year of age. Since then, I have been very much allergic to peanuts and all peanut-related products, (peanut oil, peanut butter, etc.). But this is nothing new to me. So far, for the past 21 years I have been pretty excellent at avoiding peanuts at all costs (despite some close encounters). For some reason, some hot dog joints use peanut oil, and chinese places (some) cook with it too. People are often shocked when they learn I am allergic to what they think is a wonderful thing. If I had a nickel for every time I've heard, "You can't have peanut butter??! OMG I LOVE PEANUT BUTTER." or "Are you gonna die if I breath on you after I eat a Reese's Pieces?" , I'd be insanely rich. The answer is no. I won't die. 21 years after my first discovery of my first allergy, I accepted the conclusion that I was also severely allergic to all kinds of dairy. I tried rice milk as a substitution and it may have been the cause of my hospitalization, so now I stay away from all dairy and dairy substitutes, except the soy milk found in my substitute ice cream. Although it is not a documented allergy and would never produce an anaphylactic reaction, I believe I am also allergic to the following: chocolate, red dye, most all candy, wheat, bananas & oranges, and tomatoes. So, its been fun. But I manage to survive, I still eat. Anyway, while reading "The New Yorker" this week, I was attracted to This Amazing Article , written by Jerome Groopman titled "The Peanut Puzzle". The article highlights the fact of what I and many informed and in-the-nutrition-loop people already know: that allergies are on a skyrocket. More and more kids are being diagnosed with a food allergy nowadays. Practically every classroom now has at least one kid that is highly allergic to peanuts, let alone the dairy-free kids. Parents can't send their children in with peanut lunches sometimes, or can't put peanut products into bakery items because of this alarming rise over the past couple decades. Not only is peanut allergies rising, but dairy and gluten allergies have never been higher, or more publicized. Hopefully we can only see more improvements in that area. so you can see how people are still exposed to their allergens. We can't live in a bubble. I know that during the time that I was temporarily gluten-free, eating at a restaurant was the primary cause of me getting sick. Even today, I tend to feel sick after restaurant food because of the strange things they put milk in. 2) how to know what foods these allergens are found in, and sometimes hidden in. 3) Learn how to properly guarantee that cross-contamination has not occurred. 4) learn how to correctly complete someone's meal when they make the effort to tell you (the waiter, manager, or chef) that they are gluten, dairy, egg, or peanut free. OR anything else. I know there are a couple restaurants that are catching on pretty nicely. Examples off the top of my head include "Outback Steakhouse" that has a gluten-free menu, Uno Pizzeria that has a gluten free pizza, and "Red Robin" who does not have a separate menu but have been more than accommodating to provide alternate menu choices. The best "company" that I have ever seen accommodate food allergies is Disney. When travelling to disney, I personally met with chefs so that they could personally guarantee my meal was gluten free, and show me what to order. Even on the fast food lines, it was well-advertised what was and was not gluten-free. It was heaven for allergenics. If only all restaurants could learn from Disney...heck, if all companies could learn from Disney, we'd all be a lot better off in more ways than one. Restaurants need to pick up on this fast growing....trend? problem?...pretty quick or they will not survive in business the next 10-20 years. Not only are there many people with real and serious allergies that could experience an anaphylactic reaction, but more and more people are making the choice to remove dairy and gluten from their diets, to better their lifestyle. It is becoming more and more popular with adults, as well as young children suffering from autism and ADHD. Just two years ago when I started gluten-free, unless it was in my imagination because I was "new to the field" it was not easy finding gluten-free products. And when I did find them, they tasted like cardboard. Now, in just two years, not only do supermarkets like Wegmans and WHole Foods make allergenic-shopping a pleasant experience, but ShopRItes "LiveRite" section also makes it easy and enjoyable too. The term "gluten-free" is all over the Internet and in ads everywhere (even on my Facebook page). I have two favorite products, special "K-toos" cookies that are gluten, dairy AND peanut free, and special pretzels that are dairy, gluten, soy, and egg free which is amazing. AND they both TASTE really yummy. SO thats my exceedingly long post on allergies. But no really, try and read the article if you can. It was fascinating. Lots of good information..As always, thanks for reading. (Totally) random thought of my day. Today is just one of those days that all I want to do is think in an English Accent. No, I'm totally serious. My thoughts are literally transmitting in an english accent. I am not kidding when I say I have to think before I speak and speak "normally" (for my country). Otherwise I would like a complete idiot. I think this happens when I am really stressed and my body goes into malfunction mode and my brain is all like HEY DO YOU KNOW WHAT WOULD BE A GOOD IDEA? Let's screw with Julie and make her think in different languages! YAY! I think In spanish sometimes too. Is that weird? Meaning, I think of something I need to transmit or say and then I think of how I would say it in Spanish....for some reason. Or, other times, random spanish phrases pop into my head and it is up to me to translate them....again..with the whole "brain is screwing with me thing". Do you see what I have to deal with every day?? My brain. I seriously need ADHD medication. Today is exceedingly worse than all other days. When I was a junior in high school, my boyfriend made the decision to enter in our State's NJ STARS program and do two years at our local community college before going on to a college or university. Dimwitted and naive as I was, I looked down on this choice of his, for not wanting to aim higher and reach his potential I knew he could. I thought to myself, that when that next year came for me, I would definitely be going to a college or university. To say the least, I was still naive and dimwitted. I thought community college was going to be easy. Granted, it was my first "collegiate" classes, but man, I thought, how hard could it be? I first met professor Brian Bradford during my first semester at this college, and he taught me not only English but what teaching had the power to be. He got through to us. As if I didn't already love to write and read enough already, he made it 10 times more enjoyable. He made it so enjoyable, that he made me feel like it was actually possible for me to pursue creative writing as a career. Prior, I thought it was just something in my past that I did in the fifth grade but I could never actually pursue. So, the next semester I took his creative writing workshop. My writing needed a lot of work, but had a lot of potential. My grammar was and still is, a major weakness of mine. My strength was writing dialogue. In this class I got to learn about famous writers and their unique styles, how to better my writing and also performed the art of critiquing other's writing as well. I then was offered the chance to be a part of a brand new and very advanced creative writing class, with what I thought were the "big-time" writers of the school that I had heard of. There was only about eight of us. Also, the class was also going to be "Advanced Poetry" in addition to creative writing. Normally, in order to get into this class you would have needed to complete the prerequisite of the Beginners Poetry workshop. 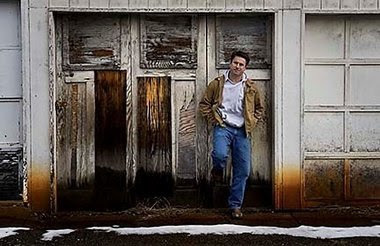 Not only had I not completed that, but I had never met the famous teacher, and I knew that my poetry was definitely something that needed a lot of help. But Professor Bradford had faith in me that I would still do very well in the advanced course regardless. To say the least, I was extremely nervous. It was a lot of hard, but rewarding work. The workshop was taught by both Professor Bradford and BJ Ward, the man featured in the article above. Upon entering the course, Professor Ward took me under his wing and gave me one-on-one lessons on bringing my poetry up to an acceptable standard. To say he helped me with grammar would be an extreme understatement. With his help, I was suddenly popping out poetry left and right that was significantly better than I ever thought I could do. During that same time, I was writing many short stories with Bradford's portion of the class. I was also inspired by all of this to work on my novel's at home, as well. I was so happy. I was surrounded not only by my writing every where, and my characters and plot lines, but every week I got the utmost privilege of going to this class with these amazing writers and professors. We got to know each other, we got to know and effectively critique each other's work, we all became friends. It was magical. I can honestly say that because of Brian Bradford and BJ Ward, going to my community college changed my life forever. I was happier there as opposed to my current college, I was happier with what I was doing. I can not imagine having not attended this college. Although the article is not written about Bradford, (he is mentioned), Bradford has many other achievements and accomplishments, but totally deserves an article as well. A blog will have to do, for now. Community college was not easy. These professors were not easy. If either of you ever stumble upon this, Thank you, for an amazing education that I will never forget. Today I attended a funeral (long story, no questions), which had an open casket viewing. To pay your respects to the deceased, it is common to go up to the casket and view the deceased and say a prayer or well wishes or whatever you want to call it. Well, looking at a human body, that has passed away is something most people will never be comfortable with or get used to. Not that anyone should. Except funeral directors. Or autopsists. Because its kind of their job. But for everyone else, its normal to feel uncomfortable. I don't feel uncomfortable, but it does create a strange feeling working with the dead or viewing the dead. In a casket, for example, the body is dressed up, groomed...it just looks as if they are sleeping. They are even in a sleeping position. They look peaceful. Then, your eyes begin to play tricks on you. Even on me, who has been around this topic for 5 years now. Here is my theory: Our brains are so wired to see people breathing when people are sleeping, that our brains actually trick us into thinking that we see the chest still rising, even as they lie peacefully in their casket. Our brains are so wired into thinking we see the normal "twitches" a person has when sleeping, that we think we saw them too. Its almost alarming, so much so that for a second we think- Did that person just breathe? And then you remember. Our brains don't often get the chance to learn the sight of seeing a human body that isn't breathing. So this is a strange sight for our brain and it does not like it. Death is a strange thing in the hospital, too. It is one thing to view the deceased in a casket. They are nicely dressed, peaceful. Well, I cannot put in words what it is like working with the deceased in the hospital. Some of the time they are a complete mess because they just suffered through a code, and most likely CPR. They have tubes in them, IVs, foleys (sometimes), sometimes they are bleeding somewhere or everywhere...there is a lot of things that could happen. And, sometimes, they didn't suffer through a code but died peacefully in their bed. Well, the hospital bed. But even so, they are in a hospital gown..their hair is messy, they are "hospital-y". I had a patient that I had worked with my entire winter break, and she was one out of 3 that was still on the floor 2 weeks later when I came back to help on a weekend. She was in the hospital for about a month and a half total (she left to go home for a day or two). So that really gives the staff a chance to get to know a person. It is even more tragic witnessing death in the hospital when the patient was walking and talking and "independent" when you remember them being admitted, to them being completely bedridden, unresponsive and hallucinogenic and barely breathing in their last minutes of life...(which has nothing to do with the hospital stay, simply just the course of the disease). It's another story completely when you, as an aide or nurse, are selected to do the post-mortem care. I won't go into details to bore or gross anyone out, but it is strange, I can tell you that. You are with someones beloved grandpa, or grandma, or parent, or child...just after their death. It is very important to treat all patients with extreme and utmost respect at this moment (in case you already didn't all the time anyway). I think a lot of people get scared when going up to a dead person...whether it be at a wake or if they are a new aide or new nurse that hasn't had experience in this department yet. Why are they scared? Different reasons, sometimes. I think people feel scared of the unknown, scared perhaps because they have never been around a dead person before, or scared that the person will come back to life, or maybe scared that the person's ghost is watching you watch the body. (Call me strange, but I always think about that). I am one of those people that believes in spirits, ghosts, souls, etc., and I wouldn't doubt for a second that the spirit sticks around most of the time when they first leave their body. But who knows. So that is my depressing blog, on death. And, as if this blog weren't long enough already, I wanted to include at the end here my first "real" (aka not written before college) short story. It was not assigned to be about death, the assignment was just to write about a moment that you learned an epiphany, or a moment when you learned something that changed you forever. And I chose to write about the first patient that touched my life- and how I took care of her after she passed. I used pseudo-names in the story, names are not real. I was 18 or 19 when I wrote the story. I'm going to include it at the end of this, so it is purely optional to read. 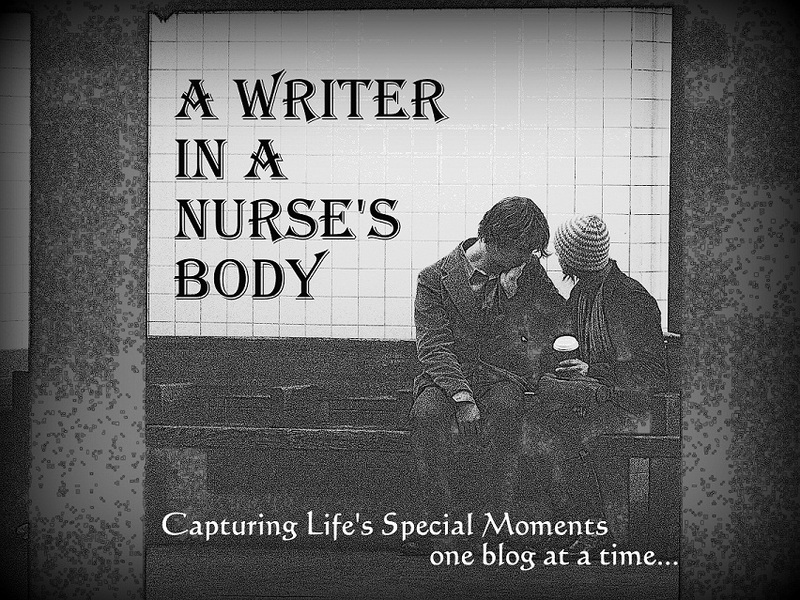 But, this blog is also about writing, and this is a story about nursing, too. So its a double whammy that fits not only into this post, but perfectly into this blog. So feel free to read it, and to those of you that do, thank you! And feel free to comment if you like it, as always. The white latex gloves snapped as they wrapped around Lyn’s small sized hands. She threw her long brunette hair that laid upon the front of her scrubs into a messy bun and then took a deep breath as she stood before the curtain. She inhaled one last time, preparing herself to see her second dead body. Only this one had just died. “Okay, I’m ready Melissa.” Lyn lightly touched the curtain in front of her as the two curtains that came together separated for her to enter the small make-shift room, walls made of curtain. Melissa was leaning on the window-sill as she wrote Edith’s information on the body tag. She placed the body tag on Edith’s right big toe, and tied it really tight. At first, Lyn was worried that it would hurt Edith if it was too tight, cutting off the circulation to the foot. Lyn took two steps over and touched Edith’s right pinkie, as she slowly let herself grab the whole hand. The top was cold to the touch, but the bottom still warm. She glanced at Edith’s watch that she was still wearing. It had only been an hour since she had passed. Lyn lifted the limp arm and unlatched the watch. It wasn’t right for a dead person to be wearing a working watch. It just reminded her that time went on without us. Time will always go on. “Can I have that? I didn’t even see that. That goes in her valuables bag.” Said Melissa as she took the silver chain watch from Lyn’s open hand. Melissa then threw it in the plastic hospital bag and tied the top to enclose the belongings inside. “What about everything else?” Lyn asked as she scanned the rest of the room. The faded red closet was open, there was Edith’s petite nightgown that she had specially ordered still hanging, and her small size 5 flat shoes beneath the gown. But Edith doesn’t have any family, she thought to herself. Edith had told her that. Melissa finished zipping the bag, which was now just a giant-oversized plastic bag sitting on the still white linen on the wooden bed. It didn’t even resemble a body anymore, let alone Edith. Great, Lyn thought. Edith was going to be naked at her funeral. “I guess so.” Lyn murmured. “Depends on who you’re asking.” Lyn murmured. “Yes Sir, Edith is ready.” Replied Melissa. For an explanation on what the flying duck I am talking about, Read This Post . I swear, I am not an idiot. But this is an accomplishment, for me. Sadly. Very, very, sadly. Okay, truth is...I had a two hour time span to read the entire paper. I'm just a beginner. I made it through ~10 pages (with advertisments), and I read about 10 articles. But I learned a lot! I learned a lot (enough) about Egypt to keep up with the discussions in my classroom, and I learned that Greece is having a terrible time keeping immigrants out of their borders (who knew?) and Afganistan is having a lot of problems with the Taliban (thats nothing new, I guess? ), I learned a lot about Mubarak, and a couple more things. I *even* watched Obama's address to our country about the situation in Egypt. But that has nothing to do with the NYT- That's only because he posted it on twitter. Figures. But, I did watch the video while sitting in the library, with the NYT in front of me, open, so I probably looked smart. Anyway, my goal is to finish yesterdays paper. I want to read it all. And then I'll start todays, and then tomorrows, etc. The teacher I mentioned in yesterday's blog post, whom I respect greatly and think is very smart, was chatting with me and a fellow classmate the other day after class. My friend asked, "How do you find all these articles? (That she talked about in class). You are so smart" (Ok, it wasnt said exactly like that, but that was the general gist of the message). And my teacher responded solely with "Well, I read the New York Times, religiously." ANYWAY, on to a happier topic....BABIES! Yesterday was my FIRST community health clinical! I was SO NERVOUS, and my partner was amazing (she did her assignment first), and then it was my turn and I was definitely nervous. We both had to do a home visit to a mother and a newborn, to assess how both of them were doing. In addition, both of these visits were either going to be in Trenton/Ewing/Hamilton/Lawrence... so, I wasn't exactly thrilled with the aspect of having to lock my doors and always be on guard when going to visit a newborn. But thats another blog post. BUT, the families we both met were FABULOUS, and so nice! And the babies were adorable. "My baby" aka my assignment, was a doll. I did my assessment of her, played with her a little bit (she was 3 1/2 months) and then I had to re-dress her and that caused her to start crying (apparantly babies don't like to be dressed because this happened on my partner's "baby" too), so I picked her up. I'm not entirely sure if the mom wanted me to pick her up, but I sensed a mutual sense of trust vibes. And, I have baby-withdrawal. I love babies. And I never get to see any. My cousins are all grown up, and I babysit no babies (they are all grown up), so I miss taking care and holding babies. So, I really couldn't help myself from picking this adorable baby up. So I held her for about 15 minutes while talking to the mom, it was so nice. She kept looking at my face and playing with my glasses, ah, I LOVE BABIES. Can you tell? Did I mention that? This baby is so cute. Wow, this baby is getting heavy. My arm is hurting. Ouch. How do mom's do this ALL day? They must have buff arms. Hmm...Holy crap, this baby is getting heavier by the second. I'm going to sit down, and put the baby on my lap. Oh, crap, the baby doesn't like that. Lets stand back up. Maybe I'll switch arms. Ah, the mom can tell I think she's heavy. She's probably laughing inside of her and probably thinks I am a wimp because its been like 15 minutes and this baby is only about 20 pounds, but it is heavy, really. Then, we started talking about how much the baby sleeps, and the mom was saying how she was lucky the baby slept until 4 am. I literally froze in my steps. With the baby in my hand. 4 am? thats lucky? I clearly will not be ready for motherhood, ever, until I can get over the fact that sleep will be nonexistent and I can throw my incessant need to sleep in or I get cranky every morning notion out the window. I'll work on that after I graduate. Well I have clearly rambled on long enough. But its okay, because I cannot think of any foreseeable blog posts that I have in mind to write about (usually I have a couple ideas), so...you can have a break of reading my retarded ramblings. I should take a class in "Not-writing-like-I-think" and therefore not-rambling. I'll work on that. P.S.= My hands smell like playdough. What the flying duck....? It has completely revolutionized our entire nation. Actually, the entire world. Because of one person. Zuckerberg is more than an entrepreneur. He should be in history textbooks...or at least sociology and psychology textbooks because with one website, he has completely revolutionized how we live. How we advertise. How we date. How we communicate. How we talk to each other. How we overthrow our government. Did you know that Egypt's current situation was started and organized by a group that got together on Facebook? That Is on the verge of unbelievable. Can you imagine? I think it is fascinating that this is how we live now. Facebook has become so engrained in our population and society, that I don't think we could function (properly) if the site crashed. Could you imagine that? What If someone hacked into facebook, or the site crashed on it's own? People would have to resort back to talking to eachother in person...or going up to a person and asking if they are single, rather than checking out their relationship status. Oh, imagine the turmoil...think of the young teenagers right now, ages 12-15 that have just recently gotten a facebook. They have entered the realm of dating with facebook to ease their fears. It is what they know, what they know how to do. You go to a persons page, check out their relationship status to see who they are dating or if they are single, check out their pictures and get to know them that way, reading all their statuses and friend comments to see their social network. If facebook went down, my generation (ages 18-26) would be fine. We entered this realm without facebook, we remember what It was like. We could go back to it. We remember writing love notes in high school, rather than writing on your crush's "wall". But new teenagers...rip it away and they would be lost, confused. It would take a while to re-train their brains on how human society possible functioned without facebook. If a business (of any kind) wants to survive and do well nowadays, they better get a facebook account...and get people to "like" them. How else can a business that targets ages 12-75 reach the people? Tv? Yes. Newspaper? Maybe. Facebook? Of course. Teachers, professors, principals..all get facebooks nowadays. Is it fair for a teacher to snoop on their students pictures or statuses and seeing they attended a party the same night the "dog ate their homework"? My college professor, whom I respect greatly and honor, told us yesterday that even she, has a facebook. The room wad silent. She then added, "I have to. If I want to see pictures of my grandchildren, that is." That thought astonished me. So, facebook is the only way she can see her grandchildren? So has facebook hindered that part of life for her or made it better? Before facebook, did she travel to see them in person? Did she receive a Christmas card in the mail annually with their pictures? Do they live in California and she never got to see them at all? Has facebook helped her get in touch and be involved in her grandchildrens lives? Maybe. Maybe both. Both of my grandmothers have facebooks, in addition to my parents (both- although they know all about my life without the help of facebook anyway), 6 of my aunts (all out of state). I think facebook has been a remarkable way to stay in touch with them all, as well as my multitude of cousins, Also all out of state. I know what they are all doing on a daily basis, I know about their lives, I can see pictures of them growing as people and families. Most of them live in North Carolina and while growing up until the age of 19(when I got a facebook) I had no idea what half of my extended family was up too. I saw them once every 3-4 years and I was nervous to "meet" them because really, that's what I was doing- having not seen or even talked to any of them in so long. Now when I see them- I feel already updated on all of their lives, and them to me. Walking around my library today, I have seen/heard the following: a group project getting together, one "head" person was instructing them that their following group from then on would be on a facebook group that the group head person had made. Walking around the library, I'd say over 50% had their Facebook pages open. A couple weeks ago, while watching "the social network" (facebook movie) in my campus student center, the majority of students had their laptops open with you guessed it, their facebooks. Facebook is mentioned or seen in a massive amount of current movies or tv shows. "the social network" is up for an Oscar, I believe. More and more phones nowadays are smartphones(whether the consumer wanted it or not) and a smartphone would be immediately rejected if it did not support the Facebook app. My phone autocorrects a multitude of strange and funny words, to facebook, in the hopes that facebook was the ultimate word I was trying to say. The "share on facebook" icon is embedded into millions of websites, including YouTube, blogger, newspapers (online), etc. You can now "share" virtually almost anything. Our president, has a facebook. I can not honestly say that I would have watched the State of the Union address if it was not posted on Facebook. I could probably say a lot more on the astonishing effects facebook has on our society. But it would be a very long post, as I'm sure it already is. Point is, facebook has changed us and who knows what will happen if the site ever dwindles out or crashes completely. Facebook has changed us, whether we like it or not, believe it or not, or accept it or not. Amazing. All because of one guy. In college. In a dorm room. P.S- I just typed "Facebook" 35 times. That, my friends, is sad.